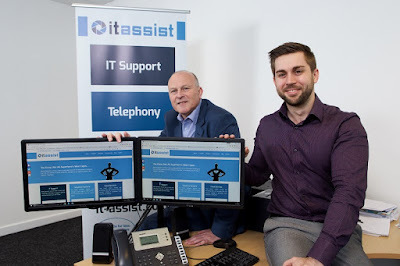 A funding boost enabled a Rotherham-based entrepreneur to fulfil a life-long ambition of establishing an IT support and consultancy services business - IT Assist. Dedicated to delivering honest, affordable, easy to understand technical advice to businesses and individuals alike, IT Assist was founded in 2016 by Danny Davies and now works with a growing customer base in and around South Yorkshire. Specialising in telephone, IT and cloud services, the enterprise secured a £500 funding boost from the UK Steel Enterprise (UKSE) Kickstart fund and was invested in remote control software, as well as signage for the company car. Danny Davies, founder of IT Assist and an experienced IT technician and manager (pictured, right), said: "The last nine months have been a real whirlwind; getting the business established and making sure that people knew about who we were and what we had to offer. "Now, we have a well-established customer base which is growing by the day. We're delighted to be delivering a range of services to a whole myriad of businesses – large and small, and spanning a range of sectors. "None of this would have been possible at such pace without the support from UK Steel Enterprise and the Kickstart fund. That initial £500 injection made the world of difference when it came to purchasing vital equipment and helping us to get out brand noticed; a challenge for any budding business!" The business was commended at the Rotherham Young Entrepreneur of the Year Awards 2016. With offices now at Denaby, three additional IT support roles are being generated in the coming months due to the success experienced to date. Launched in February 2016 by UKSE with support from RIDO and Rotherham Youth Enterprise, the Kickstart Fund consists of a £40,000 pot dedicated to supporting people looking to establish a business in the area. Allan Wood of UK Steel Enterprise (pictured, left), said: "IT Assist is a great example of what can be achieve by ambitious entrepreneurs who are looking to utilise their existing skills to set up a new business. "We're very much looking forward to following the journey of the company as it continues to grow in the coming months." UK Steel Enterprise, a subsidiary of Tata Steel, was launched in 1975 to support the economic development of steel industry areas, to this day it has helped over 6,700 businesses with investments upwards of £91m, and has created over 77,000 jobs.